Do your hands get tired of pushing tacks in and pulling them out? Does your family grouse about tacks popping out and landing on the floor? Trish Burr has a great solution for you. She was frustrated by hoop marks on her work and decided to switch to stretcher bars. But she had always hated pushing in all those tacks. She wanted a better way and came up with using Velcro. The article is an illustrated tutorial. The brand of stretcher bars she recommends is not a US brand. This should work with any type of needleworker’s stretcher bars, except, possibly, Ever-tites. Do not use artist’s stretcher bars as an alternative; they are too wide for needlepoint. For needlepoint, don’t make the tape go corner to corner, stop the tape short where the two bars meet. 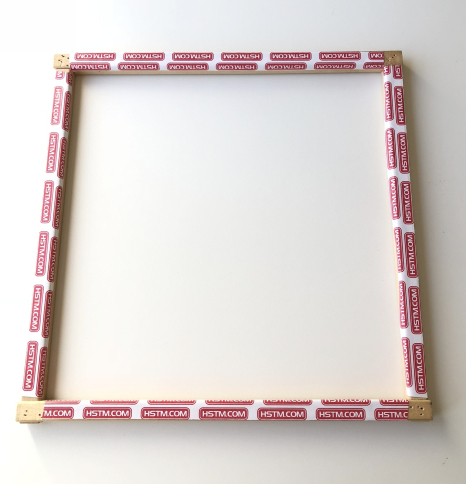 In this method the canvas wraps around the bars and is attached to the tape on the back of the frame. That means your unstitched margins will need to be at least 2″ more inches wider all around to do this. Almost all painted canvases do not have margins this wide. Instead of tacking the corners, cut the corners out and tack on either side of the corner. Use quilter’s tacks for this because their shafts are longer. The back of your frame will be sticky because of adhesive showing through the holes. You will need to buy new tape or reuse the canvas side of the tape with each new project. i’m planning on trying this soon and will report back. Trish seems to be talking about a double -sided tape such as The Stitchery Tape, rather than Velcro. Might be interesting to try, but I’m OK with using tacks. I think either could be used.